I hope everyone had a safe and happy Memorial Day weekend. The weather was beautiful for boating, camping, grilling out etc. It was not good if you were a 5 week old tomato transplant patiently waiting in the greenhouse to be transplanted. The heat and the sun (where the shade cloth couldn’t reach) scorched our little plants. After some serious TLC we think they will make it but it was quite a shock considering they were so beautiful two days ago. 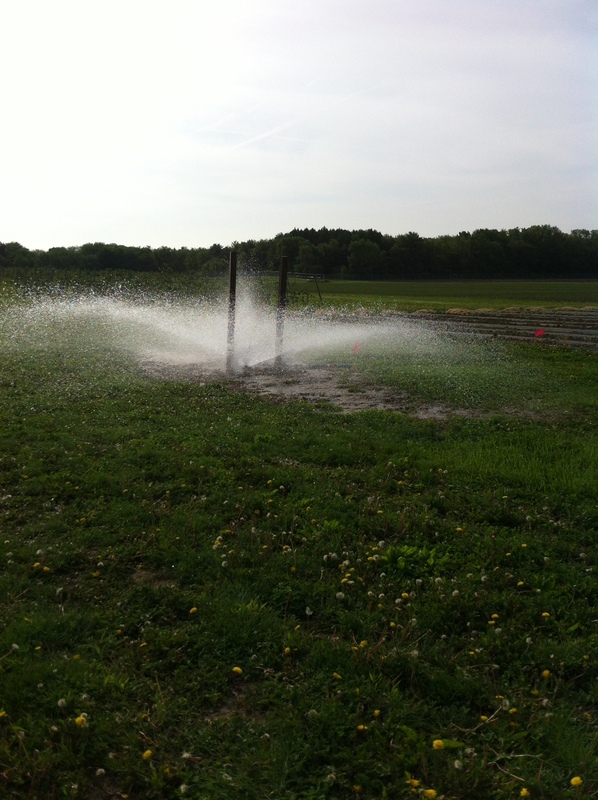 We also had an irrigation problem first thing this morning. It definitely seemed like a Monday out at the farm today. I can’t stress how important it is to know your equipment and how to fix it. I asked Kevin to turn the water on so after we planted a bed we could simply turn on our connectors from the flatline to the drip tape. After Kevin didn’t come back for a while I looked up and saw him frantically waving for help. Once I got over to him I found a soaked Kevin holding the t-handle (which had broken off in the riser) trying to keep a geyser of water from shooting out the top. I was able to locate Zack Grant (SSF farmer) who helped us shut the water off and replace the pin which had broken away from the handle. These risers contain a tremendous amount of pressure so if not handled properly can be quite dangerous. Luckily everyone was in a good mood from the weekend and poor Kevin had a change of clothes. 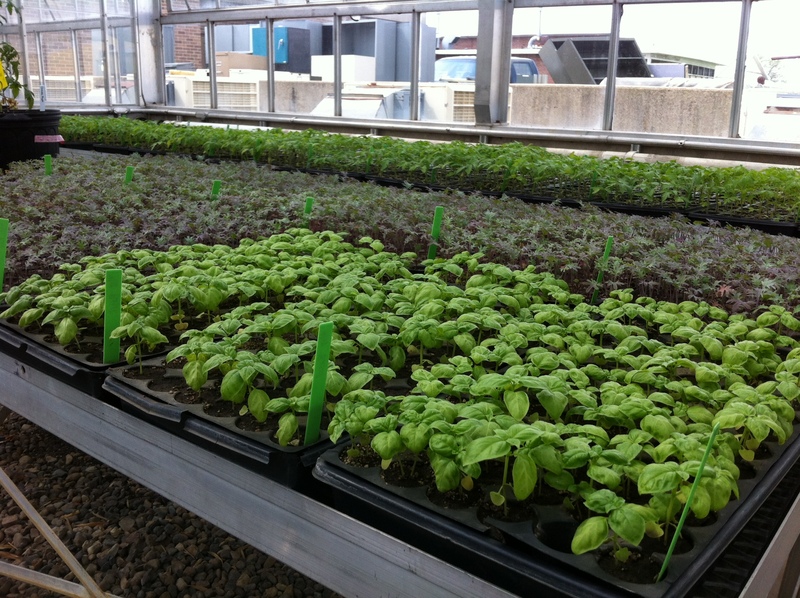 We started hardening off (getting them adjusted from the protected environment of the greenhouse to the farm) our basil and kale transplants at the end of last week and they were ready to go into the ground today. After the basil and kale were moved to the field we then put our peppers outside in the shade house. The tomatoes will be last due to lack of space. This may seem late to most farmers but our market doesn’t start until the end of August when the students come back. We finished most of the planting of the basil and kale today and will hopefully get the final trays in the ground before the rain hits tomorrow morning. 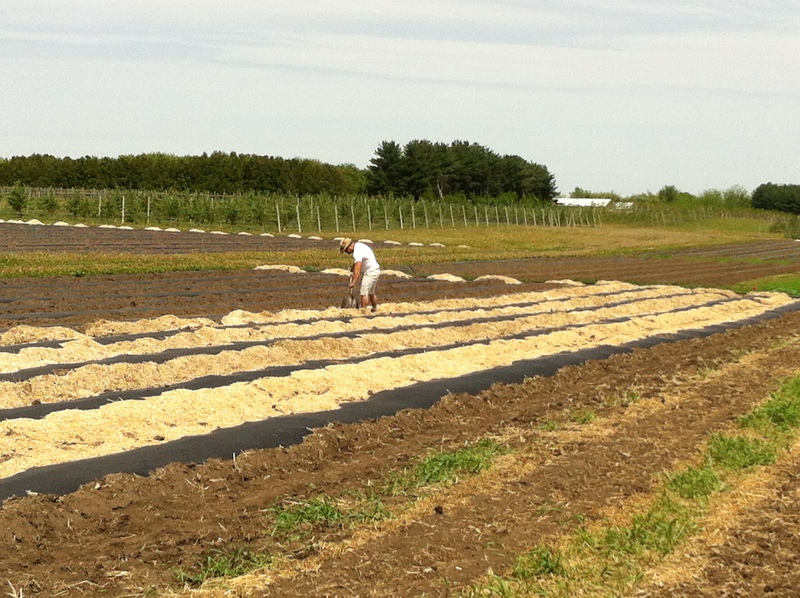 All the transplants are scheduled to be in the ground by the end of this week so we can focus on trellising next week. This is a daunting task considering we have close to 1,000 more to plant. After sliding down multiple 185 ft beds on our rear ends , we had a good laugh at who had the most trouble walking at the end of the day. Our good friend Jeremy delivered giant bags of miscanthus (mulch for the raised beds) at the end of the week last week and more again today. 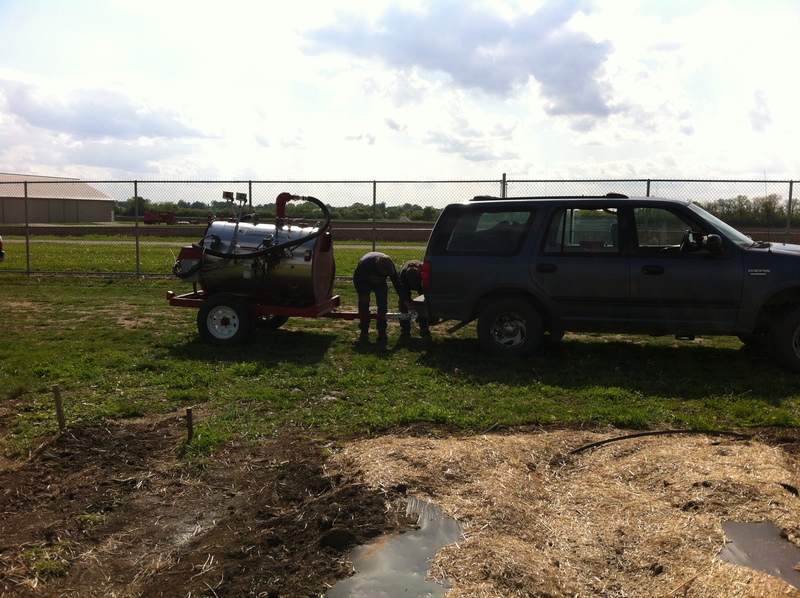 He also gave us a tractor to use to spread the mulch instead of carting it 22 times down each bed with a wheel barrel. For any of you who are new readers to this blog and did not follow last year, I LOVE DRIVING FARM EQUIPMENT! I reenacted the scene from the movie Footloose with Kevin singing across the plot “I need a hero……..”. It was pretty amazing until I got the tractor stuck and we had to call Jeremy to come pull us out. (There isn’t a picture of this because it was humiliating!) After Jeremy got us going again we were able to drive the tractor down each bed spreading the mulch and cutting our time in 1/2. Thank you Alice Cooper for one of the most fitting songs ever! The students are graduated or home for the summer and I am back in the dirt full time. I was so grateful to have had those three days the previous week to get things off to a good start. Pictured above is the steamer. It is powered by a generator. There is a hose which fills up the tank and the water boils which makes steam. (You must have a working water source near by in order for this entire process to work. :)) It then travels through a larger hose (Jeff calls it a sock hose?) under a tarp and that is what physically heats the bed. After I realized we needed water and got that problem solved, we were able to steam approx 90ft of bed at a time. This process heats the bed passed 160F. At 130F the weed seeds are killed but at 160, it eliminates pathogens in the soil as well. It is a very cool process and I was so grateful to Jeff and Julie for taking time out of their busy schedule to come and help me. Today was one of those perfect days where it was cool in the morning with a slight drizzle and warm with lots of sunshine in the afternoon. We took full advantage of it being our first whole day outside. 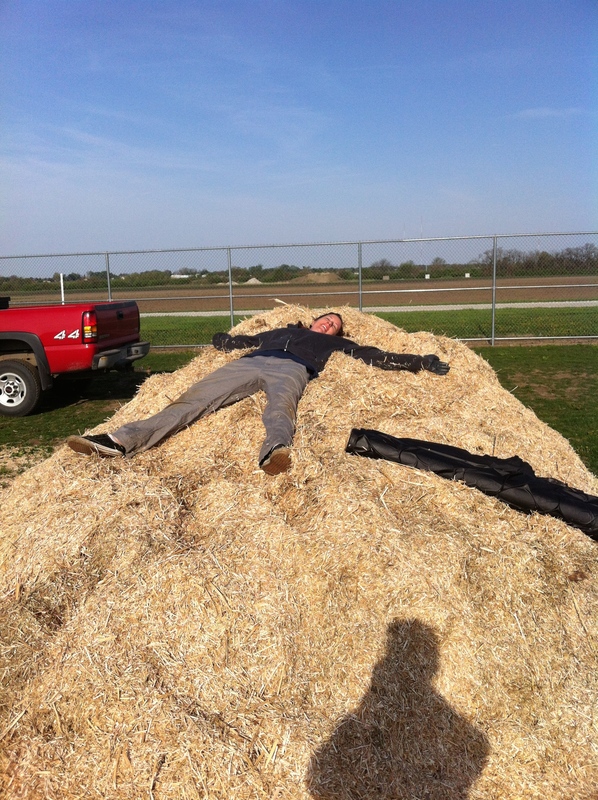 Kevin finished hauling and spreading the miscanthus pile, leaving about 1/2 of our raised beds left to go. I had to squeeze it in to a compliment sandwich (nice, negative, nice) when telling him there was going to be another pile delivered. He took it like a pro. It is extremely labor intensive shoveling, hauling and spreading this mulch down the plot. Thank goodness it isn’t 100 degrees outside yet! While Kevin was working on the mulch, I got our irrigation system set up. Unfortunately over the winter some pesky mice ate part of our flat line. I had to punch all new holes and insert them with valve connectors. After that was completed I shallowed tilled the beds that we would be able to plant before the next scheduled rain on Wednesday. I was able to get our rainbow chard in the ground before the end of the day. Let me tell you…. 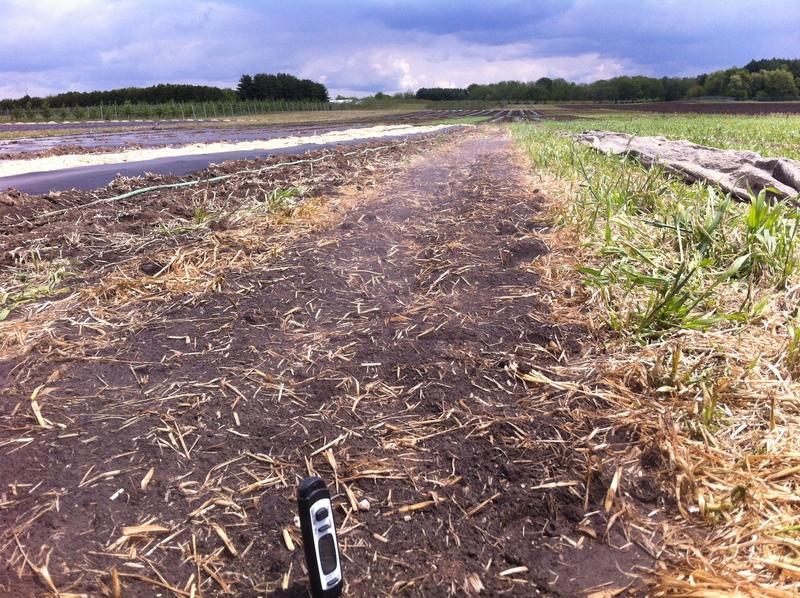 planting 3 rows in one bed every 6″ makes the end of a 180ft bed look a loooooooong way off :). 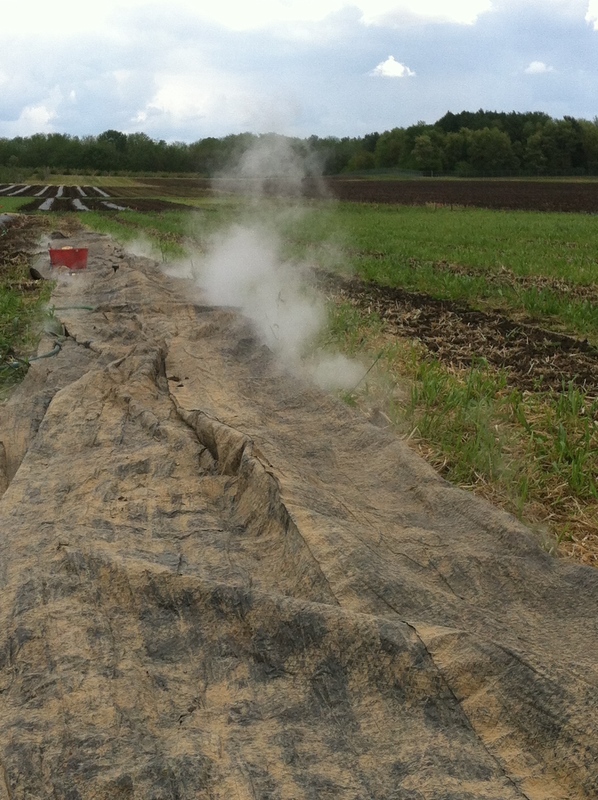 Well, our little (sort of little…) plot is under way. I had the opportunity to take a break from cooking and sneak out there for three days last week. It was so nice to be outside in the sunshine, especially after the miserable gray winter we had here in central Illinois. I figured spending three days the first week would slowly get my body acclimated to heavy manual labor again….. haha, yeah right :). Needless to say I was walking like a penguin with a nasty sunburn Friday when I went back to the kitchen. I love getting everything ready to plant. The excitement of the growing season, starting fresh, trying new ideas and being outside after being cooped up in a kitchen for 5 months is exhilarating. 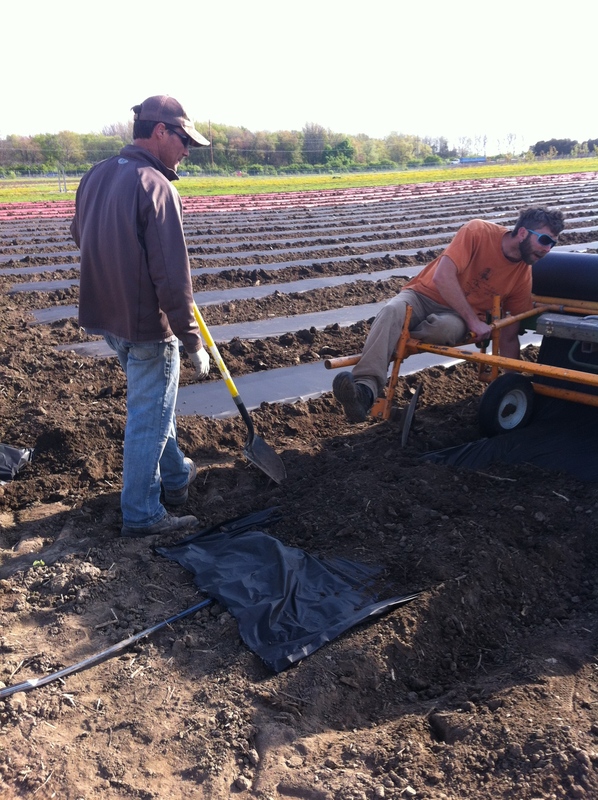 When Jeremy (coordinator, horticulture research and education centers) and Matt (assistant farmer for the student sustainable farm) contacted me to let me know my assistance would be needed to lay plastic mulch and raised beds I could hardly contain my excitement. Jeremy thought I was crazy. 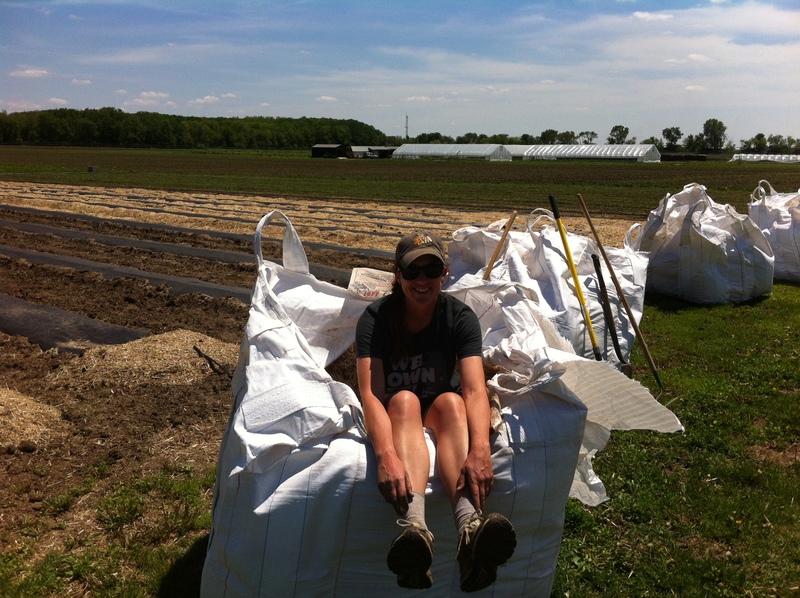 I really love hanging off the back of a tractor (as long as the plastic rolls properly). The purpose of the raised beds is to provide somewhat of a protected environment for the plants. The elevation from flat ground allows proper drainage for water and the black plastic is great for weed control. Currently I have 11 raised beds on my 1/2 acre. One of the down sides to having these is there has to be a minimum 3ft space between beds (allowing room for the tracto r). 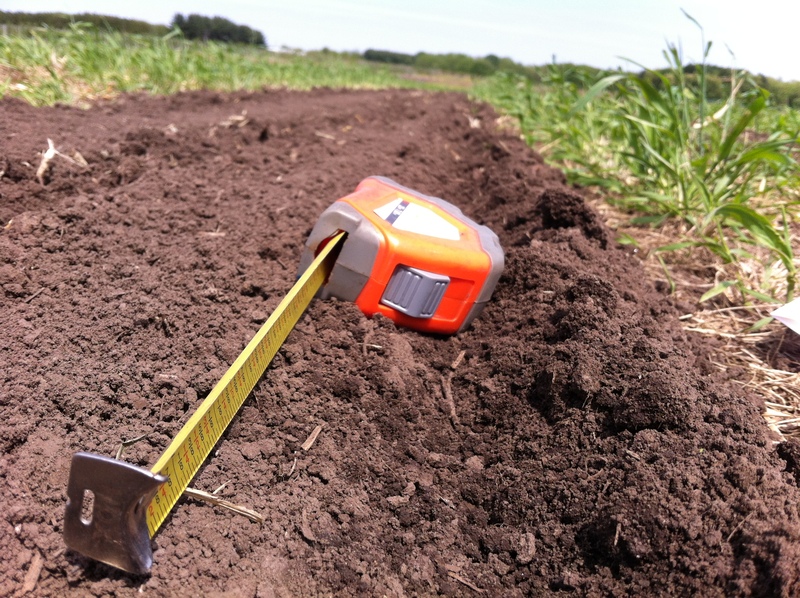 I only have 1 1/2ft – 2ft spacing between my flat beds on the other side of the plot. This really isn’t too much of a negative because it allows room for a mower/ tiller to run through the path space for weed control. 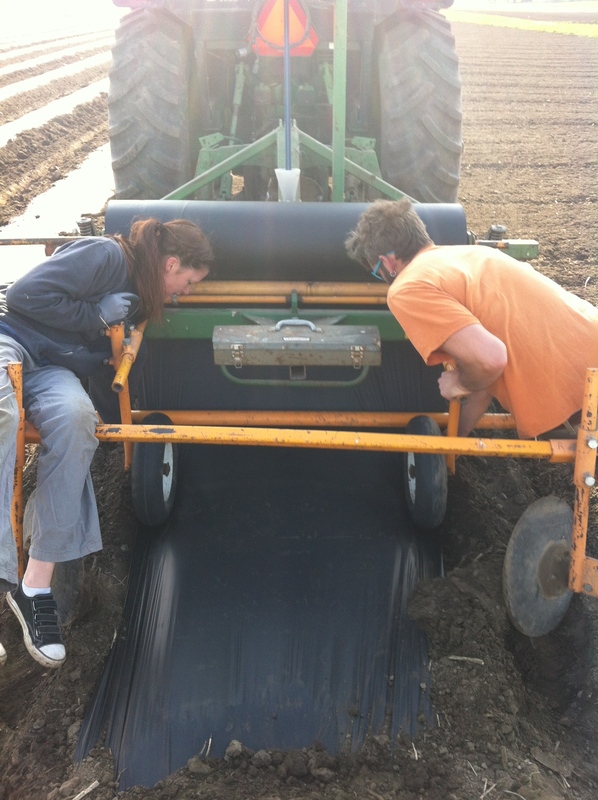 Pictured to the right is an attachment for a tractor with discs on either side, mounding the ground to raised beds, while simultaneously laying plastic mulch and drip tape for irrigation. It is very efficient. It took four of us a 1/2 day to lay approximately 3 1/2 acres of plastic. After all the plastic was laid I started work on the other 1/2 of my 1/2 acre . This area is going to be mostly direct seeded into non raised beds. 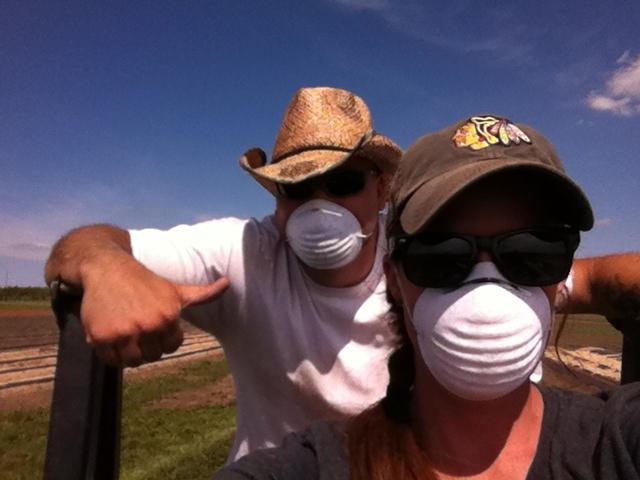 Kevin and I spent a lot of time on weed management last year. Maintaining weed control is very important. One of the main reasons is to prevent disease and also to prevent competition for space and water with your vegetables. The way we went about managing weed control our first year would be very unrealistic with a larger piece of land. It was very labor intensive. Since more land is our goal for the future, it was time to try something else this year. You may remember me saying that I planted a cover crop at the end of last year. 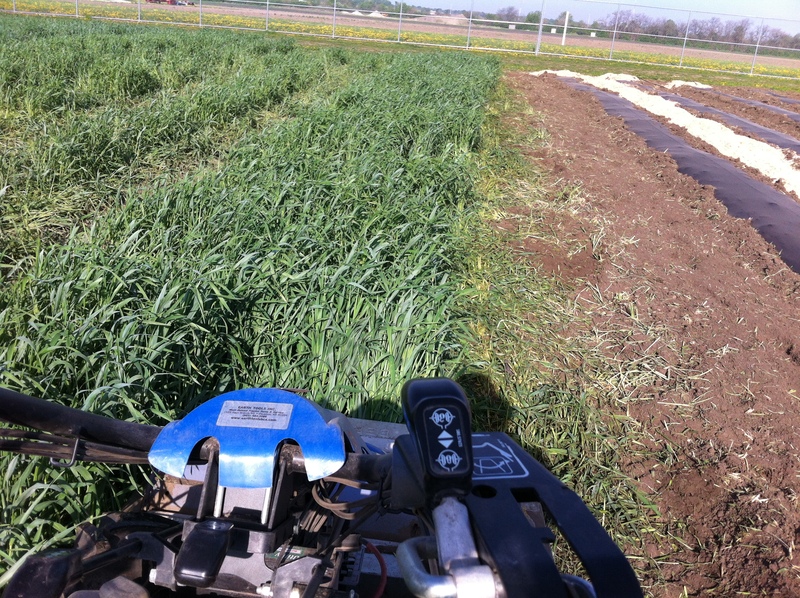 After consulting with Jeremy and Zack (farmer for the Student Sustainable Farm) I decided to only till the areas in which I would plant and leave the cover crop in the path space. In order to do this I widened my path space from 1 1/2ft to 2ft, in order to fit a standard mower between beds. We will still have to weed inside the beds but it will greatly cut down on man/ woman hours it took to weed between the beds last year. 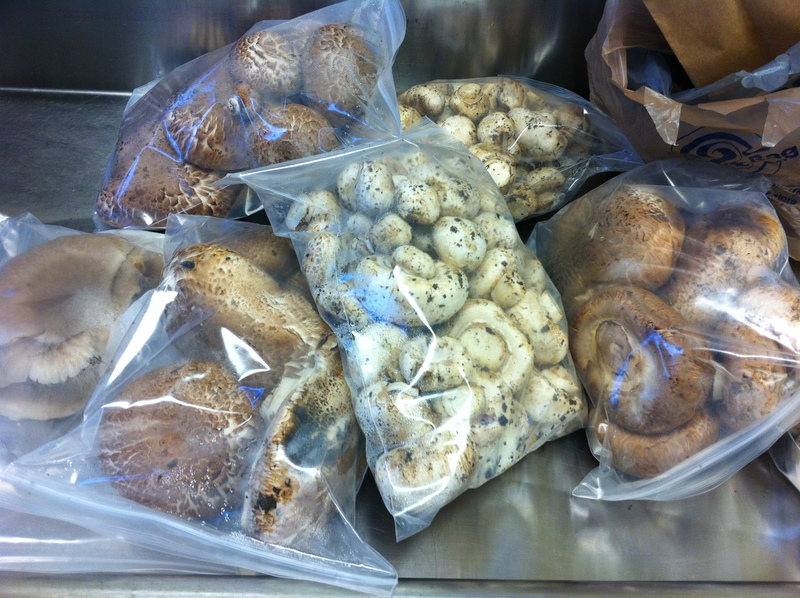 Lastly, it was time to split our beautiful transplants on Saturday. This is nearly three weeks after planting them with 100% germination again. Kevin was able to help me in the greenhouse and I could tell he also has the end of the semester itch, ready to get in the field. Less than a week!! Heeeelllllloooo! I’m Back :). Hope everyone had a great holiday season. It was a very nice break but I am ready to get back in the dirt. During the months of December, January and February I spent time planning and revising my growing plan to better suit the needs of the consumer who will be purchasing and using the product. Since our first real growing season is under our belt, I have also been trying to work out kinks in the system so that this year will go a little more smoothly. I know now what to expect and have more of a precise idea of when to expect it, so that I can plan for extra help and also packing, storage and delivery schedules. I attended a very interesting Organic Growing Convention and learned some new tricks which I am hoping to apply to our little piece of land this season. I will keep you informed with details as the season progresses. After revising my garden plan I started to get my seed order together. They finally arrived on a cold grey afternoon (typical of an Illinois winter) and I couldn’t have been happier. This meant warmer weather and the smell of dirt was right around the corner. 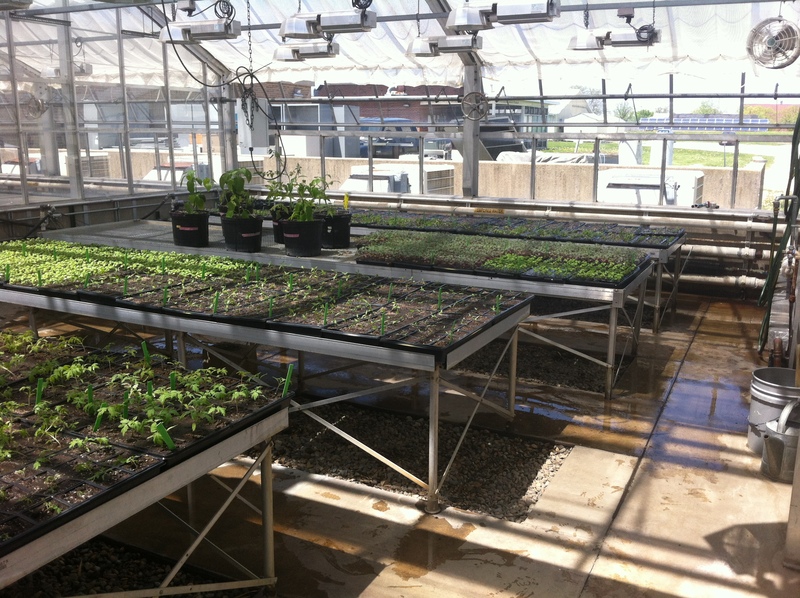 We started planting our transplants in the INHS greenhouse at the end of April. I can not say enough great things about the IHNS greenhouse. They have the most wonderful staff (Lesley Deem) who always seem to have endless amounts of information and tips to help you succeed. Since we had such great success with germination last year, I decided to grow all 3,080 of them myself. We really lucked out because we had nearly 100% germination again. 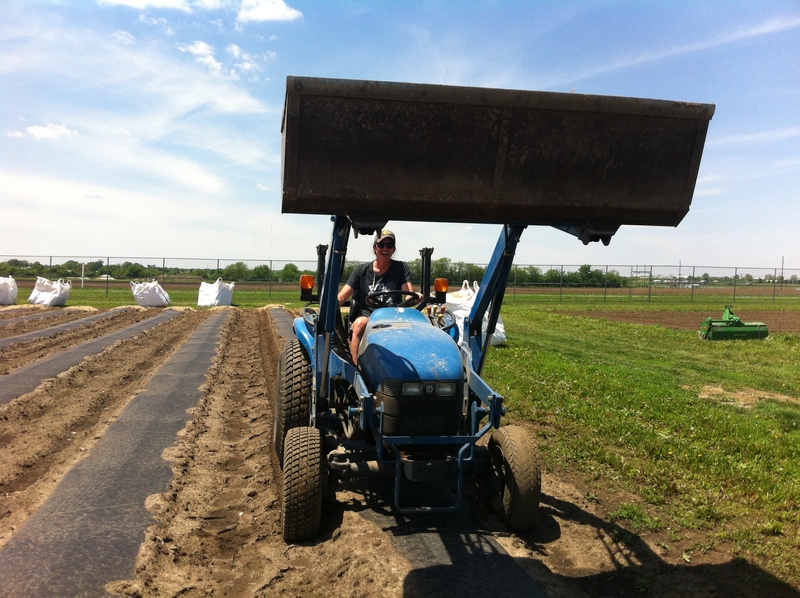 We are transplanting all of our tomatoes, peppers, basil and kale. It was amazing and very exciting to see how quickly they sprouted.Kevin and I will be spending our weekend splitting them into new trays. I am very excited to be working closely again with all of the new friends I made last summer. One of the people I mention frequently was Jeff Kindhart, the hydroponic tomato man. Now he has decided to try his hand at mushrooms. He is growing them in his high tunnels because they will be more marketable than lettuce or salad mix. Jeff stopped by a couple weeks ago and lucky for me he wanted me to be the taste tester. Needless to say they were absolutely beautiful. I’m ending here for now because I have to be up at 5 am tomorrow morning to lay plastic and irrigation on my plot. I am so excited that the season is finally here and I can’t wait to implement everything I learned from the mistakes of last year and the new information from fellow Illinois farmers! I will have to get used to the early morning hours again because it was so nice sleeping in until 7 :).